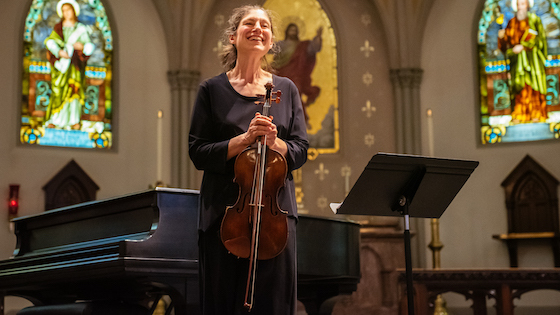 Violist Kim Kashkashian. Photo by Billie Wheeler. No disrespect of Ms. Kashkashian intended, but was she Big Ears material? Unaccompanied Bach? And, forgive me, is it even possible for a violist to be hip? Well, in a word, yes. She’s beyond hip, and she brought a wondrous perspective that creatively paired classic composers with their ultra-modern counterparts. 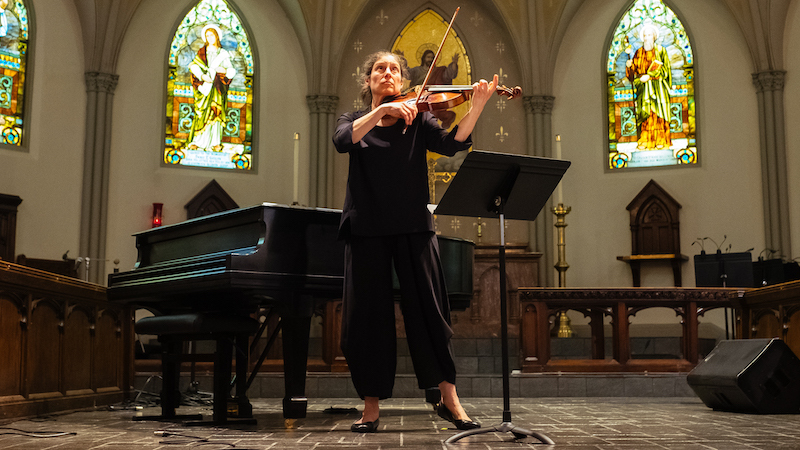 Ms. Kashkashian’s stellar reputation in the world of classical music certainly preceded her, as evidenced by the premier time slots she was given at the festival, as well as the more prestigious, larger venues. This proved a good decision by Ashley Capps, founder of Big Ears, as both her performances had long queues of people eagerly awaiting admittance. I fully believe Ms. Kashkashian added many members to her fan base who were graced with her artistry for the first time. When I walked into Knoxville’s stunning St. John’s Cathedral, I thought (there was no printed program) I was in for an entire evening of unaccompanied Bach. And I could not have been happier… nor more wrong. When Ms. Kashkashian stopped after the first movement of the Cello Suite in G Major and said she was going to play a piece by Hungarian composer György Kurtág (b. 1926), my head was filled with that horrible sound of brakes screeching. What? Who invited Kurtág to my all-Bach party? For me, this was the kind of programming I would have thought I’d absolutely and unequivocally hate. And yet the pairing of Bach and Kurtág mysteriously brought out the best in both. It made Bach’s dissonances seem presciently ahead of his time, and Kurtág’s classical orientation appropriately reverent of his musical predecessors. Kurtág movements, titled Silent Lines, Flapping/Slapping, Chromatic Argument, and In Nomine, were paired with Bach movements, titled Minuetto, Allamande, Prelude, and Courante. Bottom line: Both composers benefited from the juxtaposition to the other… something I would never have imagined I’d say. Ms. Kashkashian moved effortlessly between the two composers’ music. Her sound was sonorous and rich throughout — the type of sound you want to curl up in and take a nice long nap. It was at once beseeching and assertive. Think of the greatest contralto you’ve ever heard and that’s the dark, deep quality you hear. She was the perfect storm of preparedness and spontaneity — giving a sense she was organically creating the music in front of our eyes, while clearly maintaining the pieces’ overall structure. As for her physical presence, I’d bet the house Ms. Kashkashian was trained as a ballerina at some point. She moved her bow arm in an almost circular manner when approaching the string, reminiscent of the way a ballerina gracefully and elegantly raises her arms. There were times when she literally extended a leg and delicately pointed her toe. And her starting posture was often ballet’s “first position” (heels together, toes pointed out). In her flowing black tunic and pants, she was an absolute pleasure to watch. Ms. Kashkashian always seemed genuinely surprised and grateful for the resounding applause. During her bows, she had a charming way of holding her viola by the neck directly in front of her body, as if she were giving her viola the recognition, not herself. I found it incredibly endearing. Her second concert, with virtuoso pianist Robert Levin, included Songs from South America by Carlos Guastavino (1912-2000), Triste by Alberto Ginastera (1916-1983), Sonata for Violin and Piano by John Harbison (b. 1938), and Sonata in E-flat Major, Opus 120. no. 2 by Johannes Brahms (1833-1897). 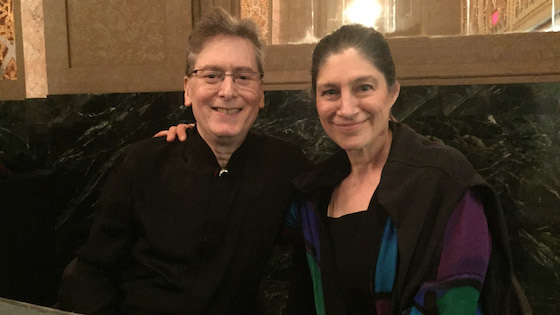 Violist Kim Kashkashian and pianist Robert Levin. Held in the spectacularly ornate Tennessee Theatre, Ms. Kashkashian took the stage as if she were just coming back from getting a drink of water in the next room. And I mean that in the best possible way. In the overall spirit of the festival, she made you feel like you were simply sharing chamber music in her living room. She created a feeling of intimacy even in the large venue. The chemistry and connection between Kashkashian and Levin was electric. It reminded me of the first question my husband always gets when he performs operas in the schools for children. “Are the soprano and tenor in love in real life?” (They never are.) All my sophomoric mind could think of when watching Kashkashian and Levin perform was that if they’re not in love, they ought to be. (I know, I know. Inappropriate.) But the communication between these two artists was reminiscent of the great movie romances of all times. They euphemistically finished each other’s musical sentences. A few times I actually felt that if I were being polite, I’d have looked away. Again, there were no printed programs, so Ms. Kashkashian and Mr. Levin provided a running commentary of what we were about to hear. The “audible program notes” worked beautifully, adding a depth to our understanding of the music. Given that many of the pieces she performed had poetry behind them, it was wonderful to hear the lyrics before hearing the music (“Do not be sad; I wait for you on the other side”) and to hear the descriptive names of the movements of Harbison’s hauntingly beautiful sonata, which foretold the stages of death (Risoluto, Passage, Night Piece, Certainties, Uncertainties, Questions, Answers). In a touching moment, Mr. Levin noted that Brahms’ Sonata in E-flat Major was originally written for, and dedicated to, clarinetist Richard Mühlfeld. Levin made the point that solo musicians often inspire composers. He said if it weren’t for Richard Mühlfeld, we might not have this beautiful sonata by Brahms. Much to the audience’s delight, he affirmed the commitment he and Ms. Kashkashian share to make themselves available to work with living composers. I suspect the Big Ears experience (no printed programs, overlapping performance schedules that allow audience members to quietly come and go from one event to the next, an incredibly relaxed atmosphere) was possibly counter to Ms. Kashkashian’s usual style of performing. If that’s the case, it was certainly not evident. She seemed quite at home in the laid back Big Ears environment. Her composure brought to mind an interview I read in which she stated that motherhood had made her a better performer. She said, and I paraphrase, that if you could withstand the vicissitudes of parenting, there wasn’t much that could happen in a live performance you couldn’t handle. Ms. Kashkashian clearly handled everything around her with elegance, beauty, and grace. And I’m quite certain I am not the only viola convert she created. P.S. If you feel you’re too old to accomplish anything of significance, take note. György Kurtág completed his first opera, Endgame (based on Samuel Beckett’s play), last year and it was premiered at La Scala. He was age 92 at the time. March 27, 2019 at 12:12 PM · Once again, Diana Skinner enthralls her readers with a brilliantly written account of memorable performances by superb musicians. Thank you! March 27, 2019 at 04:01 PM · Thanks Diana! Great article. I love your writing style! 56: Great story! You found a marvelous violist, despite the mix-up! 12: Glad to meet another convert! Thanks for your kind comment. 17: Thank you! Yes, Ms. Kashkashian is truly superb. 37: Thank you so very much!!! March 28, 2019 at 01:17 AM · Wonderful article Diana. Thank you! I'm so sorry I missed this concert. It must have been glorious. Also, to quote lyrics from the musical Gypsy: “Small world, isn’t it?” Robert Levin, Kim Kashkashian’s “virtuoso pianist” went to high school with me! I knew him in those days back in 19** but had lost track of him. I had seen his name a few times since then and was thrilled to see it here again. As a matter of fact I reached out to him and hopefully he will respond and we’ll be able to reconnect! Thank you for introducing Kurtág to me. I listened to some of his music online. And thank you for reconnecting me with Robert! March 28, 2019 at 01:28 AM · Joe, What an absolutely wonderful comment! That's amazing that you went to high school with Robert Levin!! You need to look up his YouTubes in which he gives master classes. The man can pull music from his memory like no one I've ever seen. As for Kurtág, I was introduced to him for the first time during Ms. Kashkashian's concert. I now own a CD of her playing his music!! Thanks again for your thoughtful comment! March 28, 2019 at 11:26 AM · Don't miss the superb Kashkashian/Levin recording of Hindemith's Sonatas for Viola/Piano & Viola alone. March 28, 2019 at 12:37 PM · While reading your blog, I felt very connected to the musicians, the music, the commentary during the concert, and the site itself. You’re a wonderful writer, and the fact that you can find humor in little details makes it even better. I look forward to sharing more of your musical experiences. March 28, 2019 at 03:20 PM · Super writing and review, however, it points to the inherent problem with viola....It's the dearth of literature forcing violist to play transcriptions after the 15-20 decent pieces or so have been performed. There doesn't appear to be a quick or easy solution. Clef transpositions and stratospheric position work are tough on a 15 1/2 - 16" viola. Perhaps the simplistic answer is to enjoy what we have. March 28, 2019 at 06:01 PM · Diana, you are such a captivating writer! Thank you for the perfect mix of humor, description, and personal epiphany in this article. Your take on the E string vs. C string and throwing your violin into the river had me laughing out loud! My first grader is learning viola right now, and he will appreciate your conversion. Kim’s statement about motherhood speaks to my heart, as well as your postscript about having plenty of time to do things of significance. So much inspiration here. Thank you! March 29, 2019 at 12:41 AM · To 170: I will definitely check that out! I love Hindemith, but was not familiar with this recording. Thank you! To 150: What a lovely comment! I look forward to sharing my musical experiences with you! To 253: Thank you for your kind note. You raise a really great point about the dearth of literature written for viola. I did really love the Harbison piece and I believe it was written specifically for viola. But, you're right, there remains much to be done. To 54: I'm so appreciative of your thoughtful comment. Kim's motherhood remark also spoke to me. Most of us in that boat would agree that, at times, performing is a piece of cake when contrasted to the curveballs our kids throw us! March 30, 2019 at 04:13 PM · Great article as usual, Diana. After reading your article, I'm sorry I missed Kim Kashkashian's performance. March 31, 2019 at 05:21 PM · What a great story! I wish I could have heard the concert. Kim Kashkashian is truly a treasure and the paragon of what violists seek to emulate. Today the viola is trending upward in popularity and several other great violists are also hitting the circuit, Yuri Bashmet, Pinchas Zukerman, Antoine Tamestit, Paul Neubauer, to name a few. I have to agree with Diana that the beautiful, rich C string is the reason we play the viola. But the awful E string is the reason we don't play violin! Once you switch it's hard to go back. March 31, 2019 at 08:17 PM · To 75: Thank you! And there's always next time!!! To 92: It's wonderful to think the viola "is trending upward in popularity." And I agree that KK is a "treasure and the paragon of what violists seek to emulate." Glad you're another C string fan! Thanks for your comment!